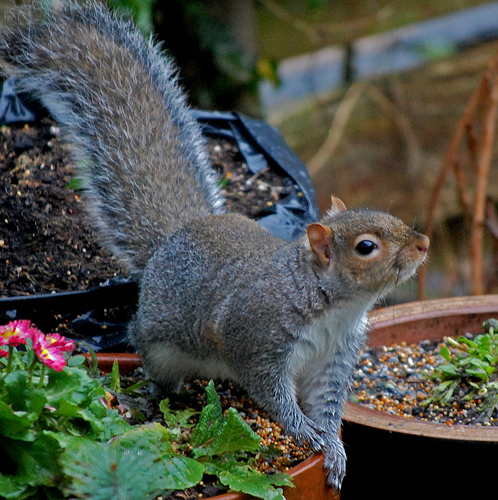 Squirrels – the scourge of the urban garden. Many people give up on gardening after their first year of squirrels eating their vegetables. While there is no one sure way to rid your garden of squirrels forever, you can try using a variety of useful methods, listed below, to reduce their access. Is there a benefit of squirrels? Yes, indeed! Squirrels carry an important component for the health of the environment. A living organism known as microriza develops and grows in the digestive tract of the squirrel and only the squirrel. As they relieve themselves, they spread microriza , helping plant growth. In other words, you don’t want to get rid of something that actually has a function in the environment. You just want to bug them enough so that they’ll stay away from your veggies. Don’t trap and relocate squirrels. This is a losing battle since the population of squirrels is extremely high. It is also illegal to release squirrels into the wild, so at best, they are just relocated to another city block. Also, if the animal is a female there is a high likelihood that you will remove her from babies that depend on her for survival. Many websites suggest various ways of killing the squirrels, but it is potentially dangerous for children and cats. Also the ethics of killing innocent animals to grow vegetables is rather questionable. Check out our top 5 ways to stop squirrels from eating your produce. 1. Put out a dish of water – the main reason squirrels eat your produce is due to thirst. They`ll take a single bite from your tomato, just to get rehydrated in an urban landscape devoid of water bodies. Provide a fresh source of water once you notice a problem with squirrels, replenished regularly to deter them from munching your tomatoes. 2. Barriers – The best ways to discourage squirrels from eating your produce is through distraction, barriers, and annoying them. Place bird netting between plant rows. Squirrels hate walking on this material. Buy squirrel guard to attach to your bird feeders that prevent squirrels from being able to get a grip on them. Keep feeders away from trees and the house. Another idea is to build a chicken wire cage about 15 inches in diameter, with the edge turned up so that all the sharp bits were sticking out. You can also construct a wooden box with open sides and top and attach the chicken wire to the frame. Alternatively plastic chicken wire can be used for a cheaper price, as it is difficult for them to climb the slippery material. Consider placing chicken wire fence along your railing to block them at their access point. 3. Distract Them – If you think philosophically – all beings need to eat, and with the size and virility of the squirrel population sometimes it`s better to work with the animals, rather than against them. Try planting some food for the squirrels at the far side of your yard – some tomatoes, sunflowers, or other cheap plants you find. You may be able to entice your squirrel thieves to another area of the yard by providing them with a better option. CD`s, hanging from strings in the wind has proven successful. 4. Frighten Them – Put a fake owl in the branches , let your dog or cat chase them (although please note that some animals are lazy and will just watch them.) Some use motion activated sprinkler systems. A newly developed motion-activated sprinkler, primarily designed to keep cats and rabbits out of gardens, may help scare away squirrels, especially in small yards or at corners of front yards where damage is most likely to occur. However, the presence of numerous squirrels, stray animals, or children may result in over watering and high water bills if they continually trigger this device. 5. Annoy them – Use scent-based repellents. Some squirrels deterrents include: Garlic, hot peppers, blood meal, peppermint or citrus oil on cotton balls, chili flakes, moth balls or animal urine. Plant squirrel deterring plants such as Peppermint, Fritillaria, Galanthus and Daffodil, Allium. Save your citrus rinds, such as orange and lemon and store them in the freezer during the winter. When you start your garden in the spring, bury the rinds just under the surface of the soil. The rinds will discourage squirrels from digging. You can also scatter dog or human hair around your garden. Add the hair into the top layer of the soil. Squirrels can not stand the smell of humans, so they will be more likely to leave the gardens alone. *Please note this is a short term solution that must be re-applied as it washes away with rain and time. Also, the squirrels will eventually get used to it. **Wear rubber gloves when preparing and applying this mixture. Take 4 cayenne peppers, throwing away the green stems. Cut the peppers in half lengthwise and chop coarsely. Place the chopped peppers and seeds in a container and add 1 1/2 cups of hot water and 1/2 cup of white vinegar. Seal tightly and let the jar sit for 4 days, shaking gently 2-3 times a day. Place a strainer in a funnel and place the funnel into a spray bottle. Pour the pepper mix into the container, discarding the chopped peppers and seeds that have collected in the strainer. Add 1 teaspoon of dishwashing liquid and 3 tablespoons of vegetable oil to the spray bottle. Screw the spray lid on tightly and gently shake the bottle to mix all the ingredients into a light emulsion. Spray in the garden, preferably in the morning when the air is still.